The wife and I will be camping at Fort Mountain State Park later this month and I’m planning operate as a portable station while we’re there. This year I will be operating a different setup from what I used in 2018. My gear this trip will be the Yaesu FT-857D radio with an LDG autotuner, a SignaLink for digital modes along with my new laptop dual booting Ubuntu and Windows 10 and two antennas. The primary antenna will be a GAP 20M monoband antenna and my backup will be a 40/20/10/6 OCFD. I have little experience with the GAP antenna so far and I’m hopeful that it will work well. Getting the OCFD into a tree in the woods is not always the most fun activity but is good practice for field day and other portable operating opportunities. I have updated the Portable Ops page with details for the grid square and dates for when i’ll be operating. Recently I came across the Youtube channel of KM4ACK and the stuff that Jason is doing with a Raspberry Pi immediately intrigued me. I purchased my first RPi in 2018 and quickly turned it into a server running Pi-Hole for my home network. Seeing as my day job is focused on Linux servers this was a natural way for me to utilize the new low powered computer and fit it into my home network in a very useful way. I saw on the NFARL club mailing list that there was to be a repeat of the ISS SSTV event from the previous weekend. Since I already had a setup for VHF ready to go I decided to install the software recommended by the email author and see what I could decode with my minimal setup. 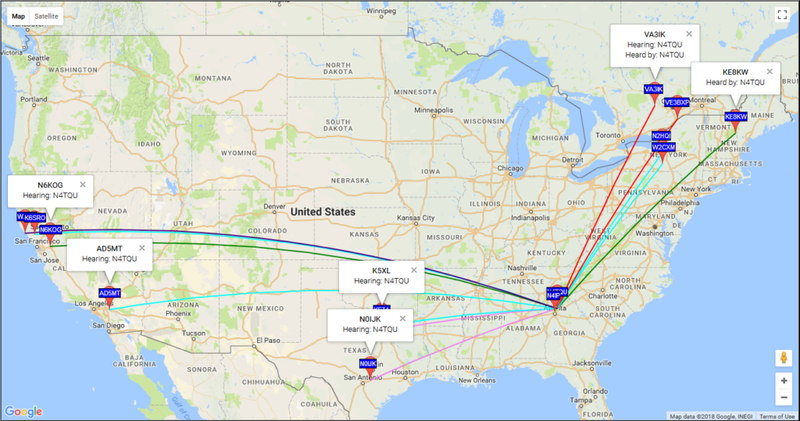 The other day I was Googling for antenna comparisons (HF vertical vs OCFD) and came across a Youtube video by K5ACL where he uses WSPR to compare his two antennas. I thought this made sense and spent the next morning setting up my Icom IC-718 and laptop to run WSPR. I left the setup to run for several hours on 20m before I enabled transmitting from my side. Below is a screen capture of showing the map of my first transmission and where I was heard. This is running with only 1 watt of power into a G5RV Jr. antenna at a non-optimal height of about 25-ish feet. 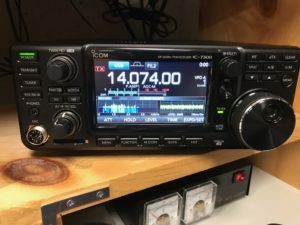 Posted in Ham Radio, Software | Tagged 20m, 40m, antenna, ft8, g5rv, hf, ic-718, icom, k1jt, k5acl, ocfd, vertical, wspr, youtube | Comments Off on WSPR You Say? Way back in 2014 I documented installing a ground rod as part of fighting my RFI issues. I thought adding ground rod by itself was enough. Turns out after reading the book Grounding and Bonding for the Radio Amateur that I was quite wrong! So I bought some 4 awg solid copper “wire” (thickest Home Depot had) and the clamps to connect the shack ground rod to the electrical service ground rod. Fortunately these two ground rods are not very far apart, about 9 feet with a corner of the house in the way. I spotted in my email a notice to my local club members that the ISS would be doing a direct contact today with the Museum of Innovation and Science (miSci) in Schenectady NY. Fortunately I spotted this about an hour before the scheduled contact was to be made. I setup my base 2m rig to listen on both the primary and backup frequencies. Then I setup my new Zoom H5N audio recorder to capture anything that I could hear. Below is a edited (for time) recording of what I was able to copy of the exchange. My radio equipment included a Kenwood D710 and a Comet GP-1 in my attic. It seems I never got around to posting here on the site that I upgraded my HF radio to a Yaesu FTDX 3000. I’ve had the radio since the end of 2014. Sadly it hasn’t seen a lot of use since I got it, for a variety of reasons. But now that my telescoping mast and the OCFD antenna are back in place the radio is getting some regular use. Recently I was visiting my Dad (WB4EHG) who let me know that he was planning to sell his Yaesu FT-857d. So it followed me home. It is an interesting radio and I plan on using it for operating in the field, preferably using a small solar+battery power source. The radio already has the SSB filter installed and it came with the RT Systems software and programming cable. And a copy of the Nifty Mini Manual! Back in February 2015 I traded in my Ford F-150 for a Jeep Wrangler Unlimited. Being a Ham of course I had to take out my existing mobile setup prior to trading in the truck and then installation into a new environment is always its own set of challenges. It has taken me several months to get a working setup. The main issue being that the Kenwood D710 head unit is kind of a pain to mount in a stable, convenient, yet out of the way location. 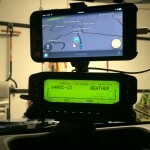 And since I also do mobile APRS I need the GPS unit in a location where it can get a good view of the sky.